Khilendra Nath and his wife Hemlata never leave their baby’s side for a moment. They are worried that they may lose her if she does not get enough attention. Little Yogyata’s haunting yellow eyes and hardened tummy bring back unpleasant memories for these parents, for this is not the first time they are at the risk of losing a child. 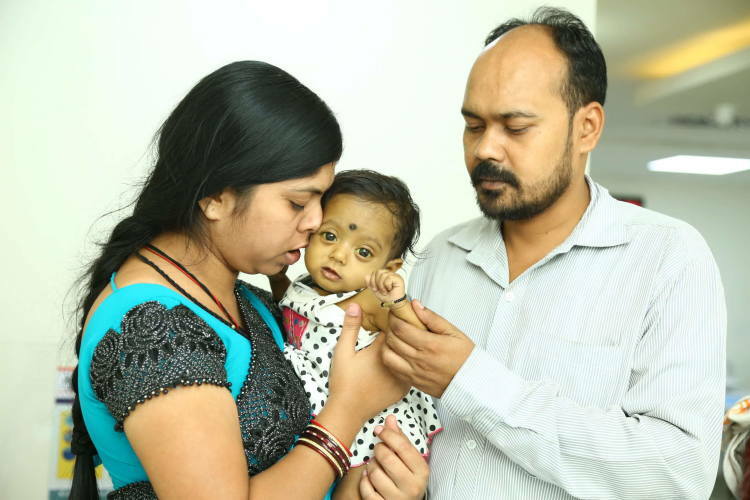 When Khilendra Nath was advised to go to a good hospital in Hyderabad to get his child treated, he did not think twice about it. He knew that he only had money for travel expenses, but he was willing to go to any extent for his baby. Baby Yogyata’s tummy is swollen and it hurts her so much that she cannot roll over like normal babies. Her liver has become abnormally enlarged because of her condition. She is not growing well like a normal 5-month-old baby should. Her parents think that she is getting more and more yellow with each passing day. 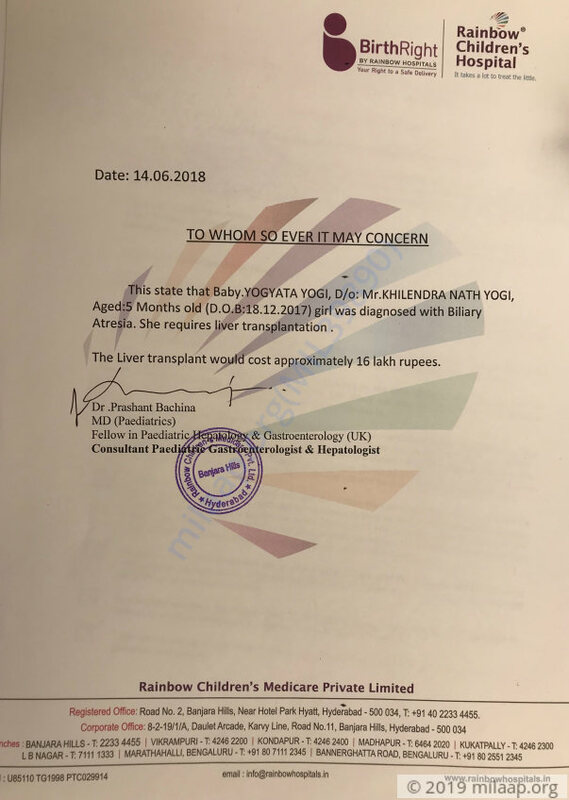 If she does not get a liver transplant, her liver will fail – doctors have told Yogyata’s parents this clearly. 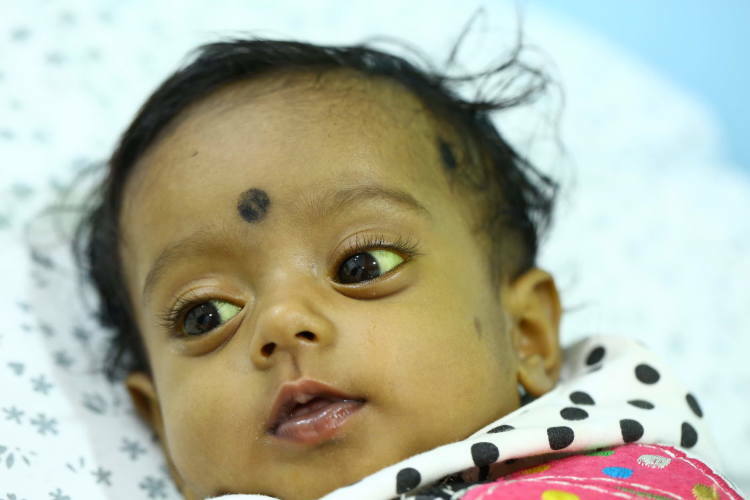 Baby Yogyata will only survive if she has a liver transplant at the earliest. Khilendra Nath works as a teacher in a small school in Raipur, Chattisgarh. His meagre earnings do not allow him to have a lot of savings, and therefore he cannot fund his baby’s life-saving surgery. Yogyata's parents are desperate to save her and need your help. Thank you all for supporting Yogyata. Yogyata is at home and is on medication. 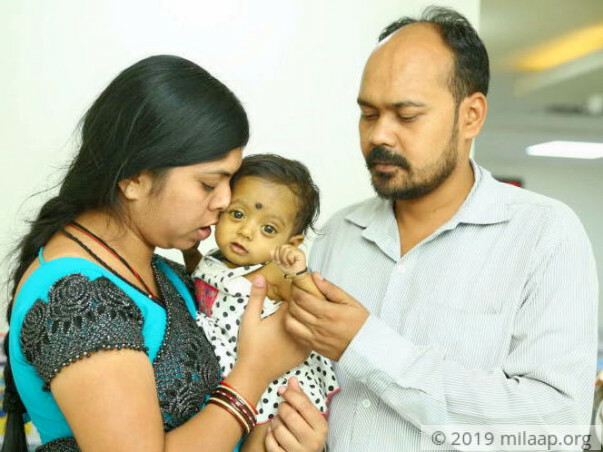 The transplant has not yet happened because the doctors wanted her to put on some weight, In order to undergo the transplant she had to weigh more than 8 kgs. She has put on weight now, and the doctors have asked us to come for a check up next month. Yogyata's health has not improved but it hasn't gotten worse either. She is at home as of now. The doctors have called us for a check up next week. They will conduct a few tests on me and Yogyata as I have been identified as the potential donor. Once they have conducted these tests, they will let us know when she can undergo the transplant. I am humbled by the love you have shown towards my daughter. I would like to share an update about her health. She hasn't yet recovered from jaundice and is on medication for the same. As of now the doctors have advised that we will have to wait for her to gain some weight before proceeding with the transplant. This is a challenge because until she puts on some weight, we will not be able to go ahead with the transplant. The doctors have prescribed some medicines to help her gain weight. My wife and I underwent blood tests and the doctors have said that most probably I (the father) will be donating part of my liver to her as I am a better match. We will be going to the doctor for a check up in the coming week. It is only after the check up that we will know when the transplant can be done. My wife and I request all of you to pray for our little daughter. Thank you for being so supportive and giving her so much love.